The Galway Cup is a youth soccer tournament held every year in Salthill Devon Fc, Galway, Ireland. The Galway Cup is one of Ireland and indeed Europe’s premier youth tournaments. The competition began in 2005 with only 6 age groups competing. It is seen as one of the most important and pivotal tournaments in the West of Ireland, as it presents an opportunity for the youth of Ireland to show their abilities. The quality shown at the Galway cup is always top tier and some immaculate football is played. 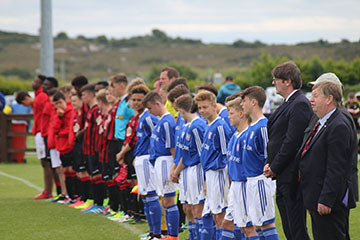 Academy teams such as Ireland, Northern Ireland, Leicester City, Aberdeen, Ipswich, Wolves and more have participated in the tournament, along with teams from the U.S. and Canada in recent times.